Young people nowadays are happiest when communicating with close friends in closed chatrooms, and preferably in WhatsApp – Facebook is the medium of choice when it comes to socialising. Those are 2 key findings of the latest survey of young people aged 14 to 19 conducted by ambuzzador and comrecon. “The first thing I do when I get up in the morning is look at WhatsApp. Then I just leave WhatsApp on all day long.” A telling statement made by a young person in the latest ambuzzador survey to examine social media usage amongst 14- to 19‑year-olds. The survey showed that social media has now become a well-established part of everyday life for young people. 72 percent of boys and 92 percent of girls nowadays go online several times a day. The WhatsApp, Facebook, YouTube and Instagram communities enjoy the highest levels of sympathy and are particularly close-knit, with Twitter and Skype some way behind. When choosing their preferred social media channels, young people are strongly influenced by their friends. One trend in particular stands out: the #selfie! Selfies let the person taking them show friends what they are doing, or where they are at that very moment. #GenerationNOW would be unthinkable without selfies nowadays. Celebs have already begun jumping on the bandwagon, of course, and are sending selfies to their respective fan communities via Instagram and Facebook. They will share pictures of themselves having a bath, visiting the doctor or sitting on a plane. But it’s not just individuals who are using the #selfie trend: companies are also benefiting from the hype surrounding self-portrayal. 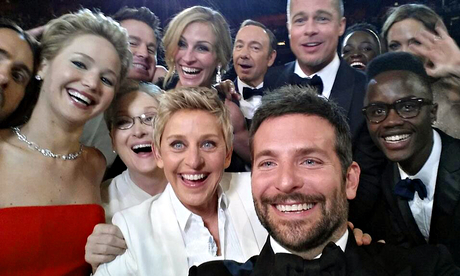 The most famous example of this to date is the Oscar selfie taken by Ellen DeGeneres and powered by Samsung. This selfie has been retweeted 3,425,027 times, and liked over 2 million times in a campaign that cost Samsung 18 million dollars. “The people we asked allocate clear tasks to the individual social networks. The time of day they use the network – and lengths of time they spend on those networks – vary according to the task.” survey manager Charlotte Hager from market research institute comrecon explains. WhatsApp tends to be used immediately after waking up, for instance, and then throughout the day, until the users going to sleep. WhatsApp’s strength lies in the rapid messaging it offers, the fact that it lets users chat with close friends in “group chatrooms”, and that it can be used to send pictures and videos free. Young people particularly like spending time on Facebook and Instagram during the morning or after school. Facebook is primarily used to “hang out”, find out news and make contacts. YouTube, on the other hand, is more likely to be used in the afternoon. Young people like watching amusing videos and the latest music videos on the platform. However, young people also go online via the entertainment channel to find out about products and how to use them. They mainly use Instagram to celebrate their own personalities, and Twitter to get in touch with their favourite stars, and watch them going about their daily business. Young people have fallen out of love with Skype in recent years, viewing it as the communications channel for parents. It is used, however, when communicating with distant relatives and friends living in other countries. Brand sympathy amongst young people is crucial if companies are to succeed, which makes it all the more important that they reach their target audiences and respond to their needs via Facebook. More than half of the young people surveyed said, they would like to play a part in designing the products and services of a company on social media. At least one-third of all the respondents would also like to be motivated by helping design those products and services, where these were applicable. Surprisingly, though, just 13 percent of young people ‘like’ a page on Facebook to enter competitions. They are far more likely to do so to gain an insight into the company (65 percent), be sent good offers (30 percent), or show friends they have strong brand awareness (28 percent). Opportunities to play a role in shaping products are absolutely crucial for young people on all the social networks. “The pronounced desire to be part of this is symptomatic of the GenerationNOW,” . ambuzzador founder and managing director Sabine Hoffmann explains. “This generation is constantly networking with one another and repackaging themselves. Young people today are growing up with smartphones in a digitalised world – where creating media content is just another part of everyday life, and is coming from everyday life.” This includes, amongst other things, selfies, or photos of themselves. Members of #GenerationNOW also set great store by their self-determination: thanks to social media and blogs, young people today are actively co-designing the image and content of the brand. “It’s no longer the one-sided advertising message that counts today, but the authentic stories and voices of the users instead. Brands need to react to this, and transform themselves into an attractive stage platform for their community. This is the only way they will be able to win loyal, long-term customers in the face of hard competition for saturated markets,” Sabine Hoffmann said. For the full survey in German, please take a look at the ambuzzador website.